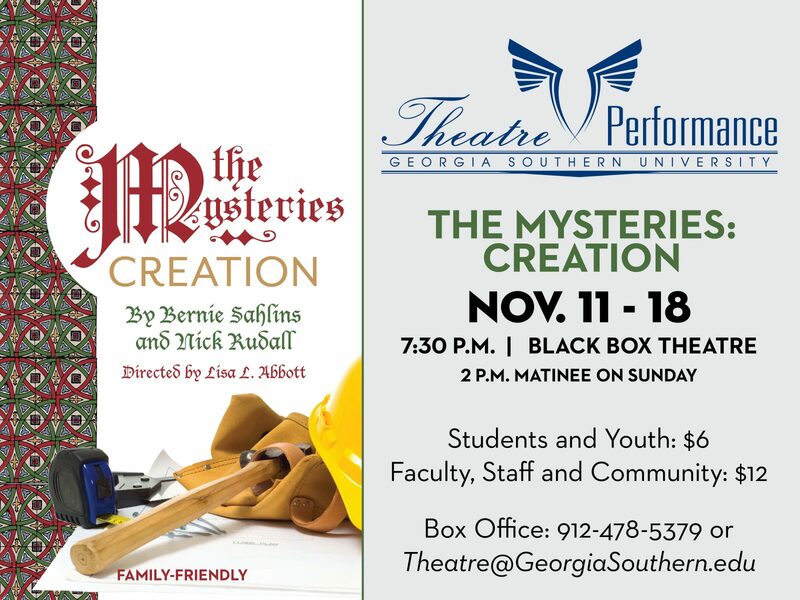 Directed by Lisa Abbott, “The Mysteries: Creation” is a modern adaptation of the medieval mystery plays that were used to share Bible stories in the days when literacy was often limited to the churches and church leaders. This production explores the biblical tales of the Creation, Adam and Eve, Cain and Abel, Noah and the Ark, Abraham and Isaac and ends with the Nativity. The show is an interactive experience with audience members invited onto the stage to join in song and dance and the celebration of these stories. During the Middle Ages various guilds of workers were each responsible for the different stories presented during church festivals. Georgia Southern’s production reflects that history with the actors playing a company of modern-day blue-collar workers coming together to perform the play. The set, props and costumes are a creative conglomeration of found materials that reflect the simple faith of the performers. A live rock band on stage adds to the energy and excitement of the performance. Featured actors in this production include Akil Jackson as God, Whitaker Gardner as Lucifer, Tyra Wilson as Gabriel, and Kathryn Burrell as Mary. “The Mysteries: Creation” opens Wednesday, Nov. 11, and runs through Wednesday, Nov. 18. All shows begin at 7:30 p.m. with a matinee performance on Sunday, Nov. 15 at 2 p.m. An additional evening performance has been added on Sunday, Nov. 15th at 7:30pm. The play is family friendly and a great theatre experience for young children. There will be no show on Monday, Nov. 16. Student and youth tickets are $6. Faculty, staff and community tickets are $12. All seating is general admission. Group prices are available, contact the box office for information. The house opens at 7 p.m., and we encourage audience members to arrive no later than 7:15 p.m. to ensure good seats. The balcony will serve as overflow seating. Call the Box Office at 912-478-5379 to make reservations. Reservation requests can be left on box office voicemail 24-hours a day. The box office is open 3 p.m. to 5 p.m. Monday- Friday for ticket purchases and reopens at 6 p.m. on performance days.